At their current and expected growth rates, tablet computers are on pace to start outselling traditional form-factor PCs by the third quarter of 2013. The bold prediction comes from Horace Dediu, author of the always informative Asymco blog. Apple’s iPad(s aapl) will lead the way, with Android(s goog) tablets following and Windows 8(s msft) slates picking up steam. Mac sales growth will continue at 25 percent per year. Windows 8 will bring only a small sales boost in 2012 as enterprises don’t rush upgrades. Windows 8 tablets will account for 7 percent of all Windows PCs in the final quarter of 2012, jumping to 20 percent by 2013. 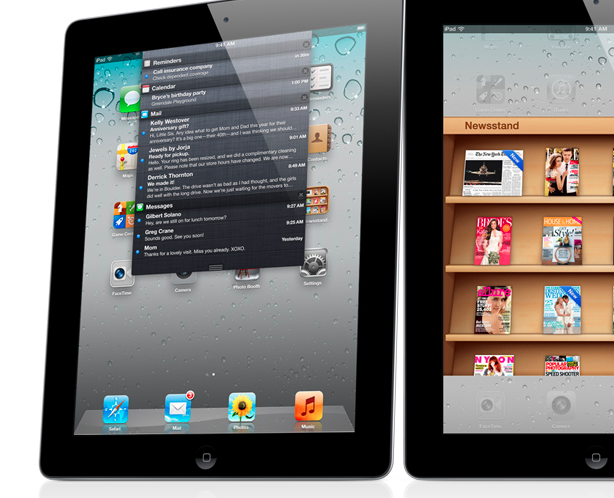 Yearly iPad sales growth will double this year and next. Sales growth of Android tablets, including the Kindle Fire(s amzn), will still lag behind the iPad, but sees 80 percent growth a year. Overall, I think these assumptions are generally reasonable, given the time frame of a two-year look and based on historical data. Even two years is pushing the crystal ball a bit in the mobile space as technology advances are cycling faster than 24 months, but again, Dediu’s approach makes sense. Naysayers will be quick to point out that some activities will always require a traditional PC. I see their point when you look at CAD software, movie production or custom enterprise applications that require some computing feature not yet feasible for tablets. For these, and similar, computing needs, I agree — for now. But times are a-changing. I noted this in my GigaOM Pro report (subscription required) just last month by explaining why the PC you buy in 3 years may not be a traditional PC. Tablet hardware is improving quickly, which brings software innovation as app developers take advantage of more processing power and graphics capabilities. Input on tablets can be a challenge, but one look at the Asus Transformer Prime and its keyboard dock offers a glimpse of current and future solutions. Remote desktop solutions abound, and some, such as OnLive, don’t even require you to have your own PC; you simply connect to one in the cloud. Simply put: Mobile devices are enabling new economies, opportunities and functions we couldn’t envision just a handful of years ago. Ignore this trend and you’re sure to think there’s no way tablets could ever outsell PCs, let alone do so within the next two years. Look at the next generation embracing tablets, however, and you start to see that the idea isn’t so far-fetched after all. I am curious – do you think all kids will drop netbooks in favour of tablets and that will be the device of choice for homework and school. Can they afford an iPad? I would stand in line to get a well-speced tablet with Windows 8 on it. But my primary machine will still be a desktop for the foreseeable future. I plan on a tablet this year and my next desktop within a year or so. Did we intentionally write this article to get page views related to the buzz around yet another version of the Apple toy? yes. No one will ever buy a tablet instead of a computer. The reason people are buying less computers is because their computer has reached a “good enough” point. The reason tablet sales are going up is just good advertising. Very few people need tablets, but buy them anyway. And most of these tablets are just coffee table Facebook Angry Birds machines. If you need to write a paper, do some research, make a spreadsheet or edit an image or video a tablet will not cut it. I respect your opinion but don’t see any evidence to agree. There are so many data points saying just the opposite. The key one is that most of the Fortune 100 companies have embraced tablets or are looking to do so. Forget consumers for a second, who are apparently buying tablets they don’t need during a period of economic downturn. Why would businesses and other organizations, such as the FAA, be purchasing tablets if they weren’t able to be used for work? So many data points, which can be interpreted in any way. Your “key” one, is people buying a product and looking to justify the expense. “I just bought a tablet, make it work with X” is not “I bought a tablet so I could accomplish X”. The reason organizations like the FAA or the healthcare industry are purchasing tablets is budget justification. There was a recent story on Ask Slashdot where someone wanted to know how to lock down an android tablet to only display a certain webpage with anti-smoking videos. Most of the answers said “use a TV” and “the technology you’re looking for is called a pamphlet”. Hilarious answers coming from tech obsessed geeks, right? Well, the guy outright refused those solutions because the hospital had been sold some tablets and they were pretty much making this guy find a use for them. Ah yes, the ol’ Apple Toy comment continue to resurface with each new product. The Mac GUI was considered a toy OS by those in the DOS community. The iPhone was considered a toy by those early Windows Mobile users. Now the iPad’s turn, it’s much easier to pass things off as a toy when we don’t understand it nor it’s target audience. There’s already a large percentage of users that are currently using iPads as their primary computers “PCs”. There are millions of consumers who bought laptops/notebooks or full blown desktop PCs in the past just for the purpose of doing email, browsing the web, researching etc. These consumers can do all this and more with a tablet such as the iPad. Outselling devices is one thing – replacing them is another! My netbook will run circles around any slate, and apps like OnLive lack Publisher – something that I use to create web graphics for example. It’s hard to see any fundamental change when real work still requires use of a hardware keyboard and full-feature software, not some watered-down mobile app handicapped by a smartphone OS. It’ll be interesting to see if other contenders come out on the market as this particular field continues to grow. Tablets IMO are good accessory devices. Great for casual use, but near worthless when you need to get real work done. Before they take the next step in replacing the traditional PC, simple things like better multitasking and input is needed. I remember when laptops/notebooks were seen as secondary devices to desktop PCs. No way could they ever replace PCs. Take a look around today, almost everyone uses a laptop/notebook as their only “PC”. 1. WTF have you been smoking this morning? 3. Is it the new Pineapple Express? 4. I’ll get back later to it! Scary stuff! How fast things change! tablets will disappear. Yes give it time and they will. PCs will disappear. For sure. Just wait and see. All you need if you are not a techy mobile gal/guy is a watch. If you are then a small mobile tablet (less than 6″-7″). But that is the only thing you need. Both watch and small tablet can talk on the go and do the things we are used to already. But once at home or indoor anywhere, you hook your device to a standard monitor/keyboard/mouse port adapter and you use it as you personal PC. I believe people think along the lines of traditional SW, when Spreadsheets appeared it was believed by the guys in white coats that they could never ever come close to what they were doing with their DB tables. The why can you raed tihs Porelbem ? In the traditional 0100100100 && 1111101010. Screw up position or get the timing ever so slightly wrong and all hell breaks loose, up to infinitive loops to correct or detect the error. Are you old enough to remember Bonanza? If you’re to young, it was an old Western TV show. 1. Now I look out the window and see a tree. 2. It’s a Pine tree. 3. Oh it’s a Ponderosa tree. 4. Did I just saw a Tree Ponderosa Pine? 5. Hey I just saw the Ponderosa on TV. Multidimensional data in action. The first two are easy to resolve the 3rd is commonly known as Ponderosa Pine, were tree is left of. 4th is mangled, yet we still get it. 5th is a primed response based on me mentioning Bonanza, if you’re old enough. Otherwise you still could relate TV show Bonanza to Ponderosa. Sorry I was playing sub-consciousness games. Now if we would have tracked your eye movements while reading this, it would have shown word1 -> word[n>2]-> word2 in other words not really sequentially controlled eye movements. Think about as priming to predict, takes less energy than full concentration of a hard to read text,4th[hope that worked]. In my example the firing of a node is basically the clock for that information live time not the information itself which is encapsulated in the path[which can be reconstructed], hence it doesn’t require absolute correct timing nor sequence. So what do we need … [cpu] cores, or SW is ahead of HW again. Why not put that kind of SW on a desktop? Most timing problems or out of sequence Porelbems occur while on the move, SW has to be smatrer hear than the fixed counterpart. Or lvie is not squeeniatl, Desktop broken up problems into many parts[apps] can be used out of sequence. But that is just the first step. Bonanza Tree Ponderosa Multidimensional data mangled sub-consciousness encapsulated smatrer hear. is this why Win8 has such a focus on tablets – to try and get into this market, possibly recognizing the change from desktop to tablet? Absolutely, in my opinion. I think it’s very telling that Microsoft is now enabling Windows to run on ARM-based chips; those that currently power smartphones and tablets. The mobile game isn’t just about phones at this point and Microsoft knows it.